"...seeing as you are forced to meddle with horses, don't you think that common sense requires you to see that you are not ignorant of the business...?" Here's the answer to another question posted on Ask Jeeves for my new novel Plenilune! Again, if you think up a question that hasn't been asked yet, just go post it in a comment on Ask Jeeves. Gwyn: does [the novel] have any prominent horses or specific breeds? This is a particularly fun question, especially for me, and I wish I had the opportunity to do it justice. Unfortunately, due to a rather important detail that I feel disinclined to give away, I am not able to go into any kind of detail about breeds in the story. Adamantine, too, is like this. And, in a way, this is a good thing, because otherwise I might be far too tempted to go into ridiculous detail about horses and give them overly elaborate names and purposes in the plot. 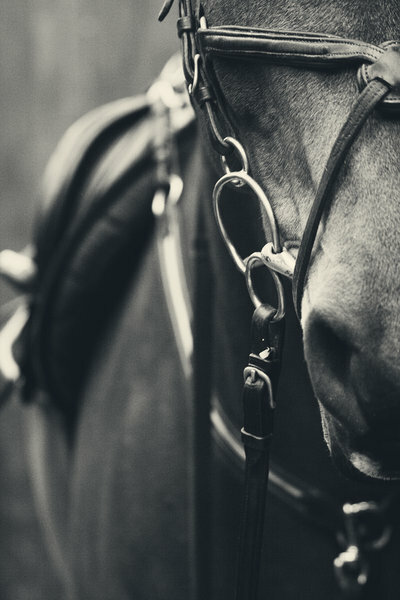 The difference, perhaps, between the two novels is that in the former horses are, in a sense, a mere means of transportation - not a means taken for granted, but still not lavished with a great deal of affection either. In my current novel, which takes place among nobles and lords, horses are a stamp of prowess and extremely important for war and sporting. The detail regarding breeds I go into is minimal. At present I have only four types: destrier, courser, hunter, and palfrey. The last three, because of the terrain in which the story takes place, often have mingled hill-pony blood in them to give them sureness on the slopes, but you are equally likely to find a horse without the stockier blood in it, it all depends on what the owner wants. Destrier: This is your "Great Horse," the kind that looks like any number of draught breeds you will see today: your freckle-tending Ardennais, grey Percherons, blond Schleswigs, Shires, russet Suffolk beasts. Generally docile, termed "gentle giants," destriers are moving battering rams. Though common enough for knights of the history we are familiar with, they are somewhat rare in Plenilune's universe as heavy armour was neither developed nor wanted. Courser: This is your more typical gentleman-warrior's horse. They are bred muscular and strong, usually with stock that is naturally obedient and good-natured with a propensity to learn quickly. Some are kept almost like dogs, fondled and made much of by their masters, which creates an invaluable bond between master and horse that can mean the difference between life and death on the battlefield. Light-boned horses are not typically used. The category depends largely on admirable personality and dexterity mingled with presence of body. Coursers are not always distinguishable from the hunter class. Hunter: Hunters differ from coursers really only in training, and then it is usually most economical to train your "light" mount to jump both fallen tree trunks and fallen human bodies. Hunters are firmly built but fluid in movement, unafraid, and tend of all the Plenilune breeds to have the most amount of hill-pony in their blood. Hunters must have a comfortable ride as well as stamina and quickness - unusual comfort is not always looked for in the courser, but if you manage to get a good hunter you are likely to have a good courser in him as well. Palfrey: I discovered that this horse-type's name, coming out of the German, means "ambler." This type has a gait like a winged trot, frequently very smooth, and can cover a lot of ground by its fluidness and persistence. The lateral gait, not unlike that employed by the camel, is left hind-left front-right hind-right front; less camel-like, and the one I enjoyed more when I tested it on my protesting hands and knees, is the left hind-right front-right hind-left front; the point is that there is at least one hoof on the ground at all times, making for a liquid forward movement that can be startlingly quick and is sometimes called "the flying pace." Because of this unusually comfortable gait they are frequently used for travelling and for ladies. A famous modern breed that exhibits this is the Tennessee Walking Horse. Cows and not horses are used among farms for ploughing. Hill-bred ponies, which are often half-wild, are used for carting, carrying, and droving. These will look most like the modern reconstructions of the Tarpan breed, but can be as large and even elegant as any one of the stocky old breeds that can be found in the corners of Britain. They are often unlovely, tough, temperamental, and among the most doggish of the Plenilune breeds. Through the stable doors stepped the first of the horses. It was the Master of Marenové’s, as was fitting: a beautiful amber champagne creature with loose white feathering about the fetlocks and the soft mizzle striking white sparks off the copperiness of its hair... Next out came Margaret’s own horse, a darcy-coloured grey palfrey that seemed, emerging from the dark interior of the long low building, to emerge from the otherworld itself. Horses are definitely very fascinating if rather expensive creatures. If anything, I hope my forced vagueness regarding breeds allows your imagination to run a bit more riot than a more definite description might. I cannot wait to read more about this novel! Well - well, I'm dashed! Coming from you, that's high praise! Unlike you, I don't have daily contact with horses, though I manage to boast a thorough training in staying on and riding a pony. I make a study of horses, but I do not have the opportunity to have contact with the flesh-and-blood creature like you do. If I can satisfy your expert high standards then I am happy. Too bad there are no coconuts in the Plenilune universe.